Ever wondered what a javelina (Pecari tajacu, syn. Tayassu tajacu) looks like from underneath? Yeah, me neither. 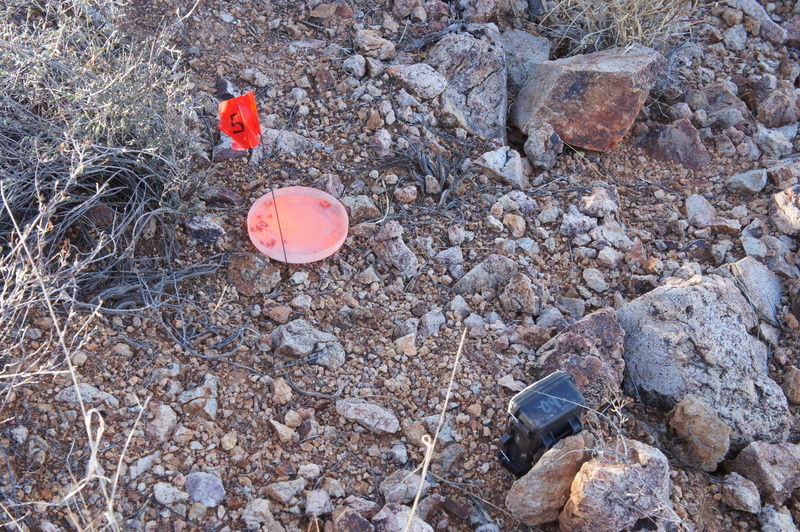 The setup: a seed tray dusted with fluorescent powder and a game camera to find out who tracked it about. I did wonder, however, whether pocket mice (genus Chaetodipus, yes, the dancing ones), known for foraging under cover to avoid predation by owls, would tend to bury palo verde or other seeds under buffel grass (Pennisetum ciliare). Buffel grass is an invasive bunch grass spreading through the Tucson Mountains that inhibits native seedlings from establishing – and provides some nice cover to these mice, potentially attracting them to bury native seeds in the worst possible place: right under buffel grass. To test this hypothesis, I left fluorescent-dusted seeds on fluorescent-dusted trays in the desert to see where mice would take the seeds, planning to return tonight with UV flashlights to follow their luminous footsteps. It felt like leaving sunset offerings to the tiny, dancing desert gods. You get a great view of their four-toed front feet, of their flexible snout at work, at their lumbering gait, and their curious investigation of the seed trays, marking flags, and cameras, and their powerful molars grinding the seeds of the foothills palo verde (Parkinsonia microphylla). One of the major reasons scatterhoarding rodents like pocket mice may be beneficial for the trees is that they protect some seeds from destructive consumers, like javelinas. Often thought to be pigs, javelina are in a different family, although still related. This is an animal that is hunted for sport and meat, and is seen as a menace and a pest as it roves through town, knocking over trash cans. It lives in a wide variety of habitats, including even cloud forests and swamps as far south as Ecuador. Check out more information on them from the Arizona-Sonora Desert Museum, or visit in person to see some javelina yourself.